This is the Third Clip in a series of three. Check out our articles for additional videos. What are the issues that the employer and employee must be aware of when they implement a deferred compensation plan for any not for profit entity? This is the Second Clip in a series of three. Check out our articles for additional videos. There are three things that never seem to change here in America: no one lives forever, relationships rule and taxes aren’t going away. Death, taxes and relationships are here to stay, and they all play a role in the past, present and future of life insurance. Yesterday, I called one of my widow clients. Her husband of 45 years passed away in a freak car accident, and now she’s trying to make it one day at a time. When our clients die, we walk in with cash to help when they need it the most. The loss of a loved one leaves a huge hole in our clients’ hearts. Life insurance can help them carry on when depression is knocking at the door. Taxes are here to stay. The first federal income tax was enacted by President Abraham Lincoln in 1861 to assist in the Civil War effort and was meant to go away five years later. However, federal income taxes never went away. Today, with the national debt registering nearly $17 trillion of debt and $115 trillion of debt plus unfunded liabilities, we are beyond the point of no return. In his best-selling book “Aftershock,” Bob Wiedemer writes, “Well, as everyone knows, there is no repayment plan.” He says there are still two bubbles that will burst in our economy in the next several years. First, the U.S. dollar will collapse, and second, U.S. government bonds will default. This means we will have to raise taxes to cover our obligations, period. So what can you do about these severe economic problems? Relationships will open doors to help you serve your clients with additional security in uncertain times. You have the solution of bringing in tax-preferred cash into desperate situations when everyone else is asking clients to pay their bills. For pennies on the dollar, you can bring guarantees into your clients’ unstable financial worlds. We are here on a mission to bring security and assistance to those who need it most. Life insurance is not bought; it is sold. Those sales happen through relationships between you and your best clients. You need to help clients buy life insurance so that you will walk in with tax-free cash when their loved one walks out. Matthew Schiff, CEO of Schiff Benefits Group in New Jersey (contact Matthew), is one of the friendliest guys I’ve ever met. He’s a sanguine extravert who is, at his core, a quick-start entrepreneur. Matthew reminisced about his earliest recollection of working with his father in the life insurance business: “I remember when I was 13 years old, I was doing data entry on qualified plans. I would go in to work in the morning with my father, then take the train to the yacht club and sail through the afternoon, and my mother would pick me up. The world is changing all around us. Qualified plans have changed. Our clients’ income has changed. “What works for us today are our marketing campaigns to our centers of influence,” Schiff says. “We’re showing clients how to create executive benefit plans for their key employees. We set it up on a tax-efficient basis, and if they want to, they can fully recover their costs. “If I look at what ties the past, present and future together, here’s what I see. In the 1970s, it was all about defined benefit income. Pre-1974 ERISA, it was all about creating plans to benefit the owners and key employees of companies. We had a long time-horizon. We looked out 10 years with a 7% interest rate. We got into the ’80s and ’90s, it was fast money. Share your competence with those who can use it most. Help others solve their problems with tax-efficient, investment-grade life insurance. is president and owner of M21 Consulting in Scottsdale, Ariz. His organization works exclusively through and with the high-net-worth and business clients of independent registered investment advisors, independent broker dealers and a few other financial professionals. M21 Consulting does not solicit clients directly. Stephen also has a long history of industry leadership. He is a Life and Qualifying Member of the MDRT and holds numerous Top of the Table and Court of the Table qualifications. He served as MDRT president in 2006-2007. Stephen also has served on the board of directors with both the International Forum and the AALU. is the president of Schiff Benefits Group, specializing in the design, implementation, financing and ongoing administrative support of supplemental executive benefits programs. With more than 20 years of experience in the financial services industry, he is recognized as a leader in the deferred compensation field. 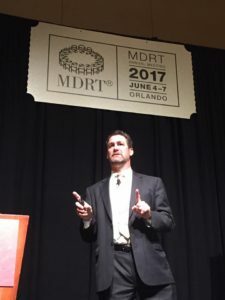 Matthew is a Lifetime Member of the MDRT, with nine consecutive Top of the Table distinctions. I’ve been a part of the life insurance business for the past 30 years, and like a lot of industry veterans, I’ve seen my share of change. A lot of the more experienced agents back in the early 1980s used to tell me — a newcomer at the time — that the business had shuffled along at a fairly slow pace until universal life burst on the scene. That single product brought an era of change and challenges, and although UL is now viewed as a traditional product, it seems like the business is still living in that era of rapid change. At the risk of stating the obvious, though change is often difficult, it’s clearly not all bad. Whether change is good or bad for producers depends much upon how the producer integrates new developments into his or her business, and how willing he or she is to look beyond the immediate challenges toward a more successful future. The best producers do just that, and for this month’s roundtable, we are asking some of the most talented, most forward-thinking and most articulate producers around to share their thoughts on the future of our business. No doubt we face some real challenges. But the future also provides some tremendous opportunity, and we’ve asked the following panel to share their thoughts on just what lies in store: Micki Hoesly, CLU, ChFC; Stephen O. Rothschild, CLU, ChFC, CRC, RFC; and Matthew E. Schiff, CLU. Charles K. Hirsch, CLU: There continues to be a tremendous focus in the life insurance business on the boomer market. That seems sensible when you consider the financial needs of the large number of people in that age group. But it also makes one wonder whether the business may be neglecting the needs of other demographic groups — like Generations X and Y. What are your thoughts on that? Micki Hoesly, CLU, ChFC: There seem to be several logical reasons for the current focus on boomers. First, the boomers are now in the pre-retirement and early retirement years, which are critical times in their financial lives. Additionally, the average age of advisors has been getting much older, meaning that many of the advisors are also boomers. It wouldn’t be surprising for their focus to be on people of their own demographic. There is also the wealth of the boomers’ parents’ generation, which is beginning to transfer, prompting an even greater need for financial advice. But I don’t believe that Generations X and Y are being ignored. Every professional meeting I attend has information-packed sessions about how advisors can meet, communicate with and serve the X and Y generations. There are also sessions on how Gen X and Y advisors can meet, communicate with and serve other generations as well. I believe that advising Gen X and Y offers a great opportunity for advisors to build multigenerational practices so that the wealth built by each previous generation is preserved through their children and their grandchildren. We can do that by either strategically making multigenerational planning with specialized products and services for each generation, or we can do that by apprenticing X and Y generation agents with our boomer agents to create multigenerational practices serving multigenerational families. Stephen O. Rothschild, CLU, ChFC, CRC, RFC: Our industry has aged, and it is only natural to work with prospects close to your age. I worked with boomers before the name existed. Sadly, we do not have enough younger agents to work with their own age group, like Generations X and Y. Thus, it is not neglect but lack of younger entrants in our industry. As Generations X and Y age, they will get more attention paid to them as they will earn more and inherit more. They are also being addressed in some non-traditional ways. They are more likely to buy over the Internet, through worksite marketing, and through agents who have set seminar methodologies that address their market and needs. Matthew E. Schiff, CLU: The insurance industry, as well as the professionals in it, has always looked at the demographics of a population and tried to focus its energy on the largest population. In this case, the baby boomers have been, and probably will be, the industry’s focus for the continued future because it’s the largest demographic. This does leave the under-45 market underserved, and I believe that the best way to help those in this market is by fostering the hiring of financial advisors under that age who can relate to their peers. Hirsch: Some companies and some producers are doing a lot of work in various ethnic markets. Is this a trend that makes sense to you, and do you see it continuing? Where do you believe we are headed in the area of serving the financial needs of specific ethnic groups? Rothschild: Those addressing the various ethnic markets are simply following demographics. Population trends and birthrates show the ethnic markets are growing at a faster rate than the non-ethnic markets. The same logic applies to entrants into our business, as new insurance agents will often address their own ethnic market. Schiff: This is not a new trend. New York Life prides itself in its ethnic marketing and has for many years. Their company, like many others, is focused on diverse markets. It’s just that, to be effective in those markets, just like any specialty, it takes time to establish a reputation and a presence in the specific market. As for where we’re headed, the industry as a whole in the United States has to hire more diverse agents. Carriers that develop career agents understand that. But because of the drop in new agents over the years, it may be difficult to have a large impact in ethnic markets. Hoesly: Many top-producing advisors have built practices that strategically focus on one market or one client demographic. Narrowing the focus allows the advisor to completely understand the needs of that market and become a recognized expert. With the United States becoming increasingly diverse, it makes sense to serve the needs of a defined demographic and provide specialized services that are specific to that market. This could be based on ethnicity, on age, on the type of business or those who need a certain type of service. Hirsch: When you look around at the competition these days, it seems there are more sales coming from or through non-traditional sources — like banks, the Internet, etc. Is this type of competition something that producers should fear? Or are there good ways to partner with these non-traditional sources to benefit everyone? And looking even further ahead, what type of competition do you believe has the potential to negatively impact the producer’s business to a significant degree? Schiff: No. “Insurance is a product that is sold, not bought” is a well-known anonymous quote that describes our product. If agents get concerned that the commodity portion of our products are being sold through different channels, then we as agents have brought no value to our clients. To partner with the non-traditional channels, you need to be a specialist at what you do, like a doctor (OB/GYN, orthopedist, family doctor, etc.). This brings value to them where they don’t normally have the expertise. But in my 21 years in the insurance industry, the only thing that can negatively impact the potential sales of life insurance is not competition, but rather legislation. Hoesly: There is more need for life insurance and financial advice than our current advisors have been able to reach. Offering good products and services and reaching more people and encouraging them to take hold of their financial lives makes us all better. I don’t believe that producers should fear alternative distribution as long as it is reputable and builds on the good character and values of putting clients’ needs first. The risk I see is competition that is deceptive, products that are financially unsupportable, or companies that put the guarantees of the industry in question. I think the greater risk today is the onerous disclosures and restrictions on advice that make it difficult for clients to understand their options and sift through the complex array of products and strategies. It seems backwards to me that the more licenses one holds, the more the advisor is restricted in how he or she can communicate and advise clients. Often, procedures appear to be primarily driven by the need to defend and not by the need to inform. If we lose sight of our primary purpose — helping the client do what is in his or her best interest — then our service loses its value. So where do I see future competition? I see it coming from the bold firms that believe clients need advice and that are not fearful of having that advice subject to fiduciary standards. I see it coming from advisors who understand that clients are overwhelmed with too much information and that a valuable service we provide is helping them find which information is significant and meaningful to them. Rothschild: Producers who have not grown or changed should have great fear. Competition is coming from banks, registered investment advisors, broker-dealers, casualty brokers, accountants and a few attorneys. Many life producers have entered some of the competitors’ arenas as well, particularly in the investment arena. The key is your ability to differentiate yourself. This analogy applies to the producer as well. Being a trusted advisor is no big deal. Rather, it is just table stakes. Is a prospect going to work with someone they don’t trust? Becoming the most-valued advisor is what is important. How is the advisor bringing value to the prospect? Are you leaving it up to the prospect to determine the parameters of value? Or are you helping them determine these parameters? At our firm, M21 Consulting in Scottsdale, Ariz., we work primarily with independent registered investment advisors and independent broker-dealers. We do not go after the retail market directly. We bring our expertise to those who want to deepen their client relationships and diversify and increase their revenue. Their high-net-worth clients are our target. Other producers can partner in other ways, or others can partner with life producers. It depends on who is doing the marketing. I am never concerned about a negative impact on the producer’s business, as there are still way too many prospects who are never called on or do not have a life insurance advisor. Again, those who don’t make changes to their practice will find themselves out of the business.